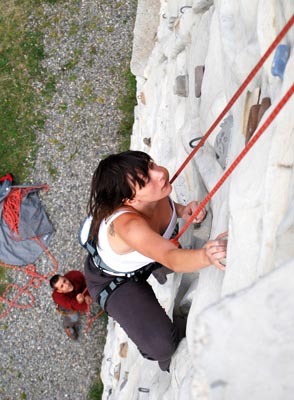 Discover the climbing walls and different climbing trails in Andorra. 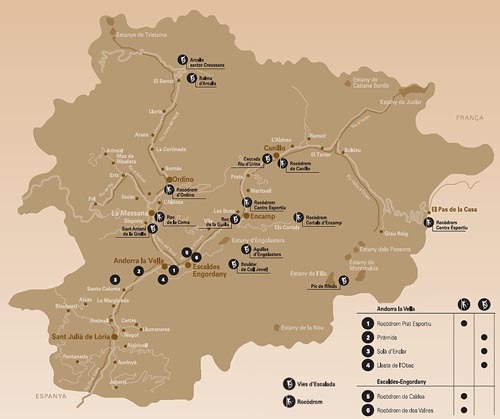 The Principality of Andorra is the ideal destination to go climbing, as there are numerous places for it. Thanks to its excellent geographic location, Andorra houses wonderful climbing walls and natural areas where you will enjoy of this exciting activity. Most of the climbing walls and trails are located towards the interior, except the Centro Deportivo de Pas de la Casa Climbing Wall and the Ribuls Peak. Next you’ll find a map with the different climbing walls and natural areas existing in Andorra. Description: Hair-raising 150 metres wall located at 1,200 metres high. It can be used all the year long. Location: Down from Santa Coloma towards Sant Julià de Lòria, taking Gill Torres street and following the yellow dots. Type: Granite rock with parabolts. Difficulty: from 4 to 8a. Description: You are in the place with more climbing areas in all Andorra. It is located 1,100 metres high in the southeast of the principality. Here is possible to climb all along the year. It has four areas: Cementiri, Bigabloc, Esfinx y Santa Coloma. It is a granite rock. It is recommended to take with you parabolts and adhesive anchor bolts. Location: going down from Santa Coloma towards Sant Julià de Lòria, take the road to the cemetery. Then, take the path departing at an angle to the right side from the parking lot. Difficulty: from 4 to 7. Description: It is a quite flat rock located towards the north, so it is recommendable to visit it during the most dry days,as it is also surrounded by a lot of vegetation. Location: from the path to the water canal in Obac, in Tarragona Avenue, you will find the way to the vías. Difficulty: from 5 to 6b. Description: It is 1.150 metres high to the east of Andorra. It is made up of 2 sections. It offers wonderful panoramic views, as it is located next to Valira del Nord River. Location: From Escaldes-Engordany you can go up towards La Massana and, after the first tunnel, park next to the Puente de Sant Antoni Bridge. The path takes you to the trails. Difficulty: from 5 to 7c. Description: This is one of the small walls (not more than 18 metres high). It is located 1,620 high, to the northwest of the country. It has 5 areas: Figa, Festa, Del Sostre, Frankfurt and Can Faltegan. Location: Toma la carretera en dirección a Engolasters que hay en Escaldes-Engordany y síguela hasta el km. 6.3. Una vez aquí aparcar y sigue el camino a pie. Description: They are “Agulles” between 15 and 30 metres high. They are located around 1,740 metres high to the north of Andorra. From here you’ll get impressive views over the Valley of Andorra. Location: from Escaldes-Engordany take the road to Engolasters until kilometer 6.3, where you will have to park your car. Take the left path, a soft trail at first, and steeper at the end. It normally takes 15 minutes to walk to the trail. Description: It’s a 2.780 metres peak located at the end of the Círculo de los Pessons, in Ribuls Peak. Its height makes it have very mild summers. Location: From the station of Grau Roig, follow the path to L’Estany and then take the first left path. Description: Located 1,150 metres high to the south east. It is very nice, as the is a waterfall crossing the wall in the middle. Location: It follows the road of Canillo until the one going up to the Valley of Mereig. After that, follow the road until the curve and park there. Cross the river and follow the way to the waterfall. Type: Calcareous rock and parabolts. (with waterfall). Difficulty: from 3 to 6a. Description: The ferrata de Erts climbs from the left side through long relieved areas with chains. On this trail you will find the best slighly atheltic tramos aéreos. Location: access is done through a path next to Casa de Quart House, in the left bank of the river, going up to Arinsal. Description: Open-air climbing wall made of natural rock opened all along the year. Location: calle Prat de la Creu de Andorra la Vella. Description: Caldea climbing wall, entrance paying. Description: Open-air climbing wall open all the year long. Location: Centro Deportivo de Ordino, next to the parking. Location: Carretera general de Canillo. Description: This climbing wall is open all the year long and to access it is necessary to buy a ticket. Location: Centro deportivo de Encamp. Description: Open all the year long. Location: You should take the road of Encamp and, once in the rotunda of Funicamp, turn to the road of Cortals de Encamp until reaching the intermediate station of Funicamp, around 10 kilometers in. Description: Open all the year long and to access it you must buy a ticket. Location: Centro deportivo de Pas de la Casa.